On Tuesday at Southern High School, senior Paige VanMeter signed her National Letter of Intent to join the OU-C softball team. Sitting in the front row, from left, are Mike VanMeter, Paige VanMeter and Kathi VanMeter. Standing in the back are SHS Principal Daniel Otto, Lady Tornadoes head coach Alan Crisp and OU-C head coach George Beck. RACINE, Ohio — One game into her senior season, Paige VanMeter’s softball future is set. 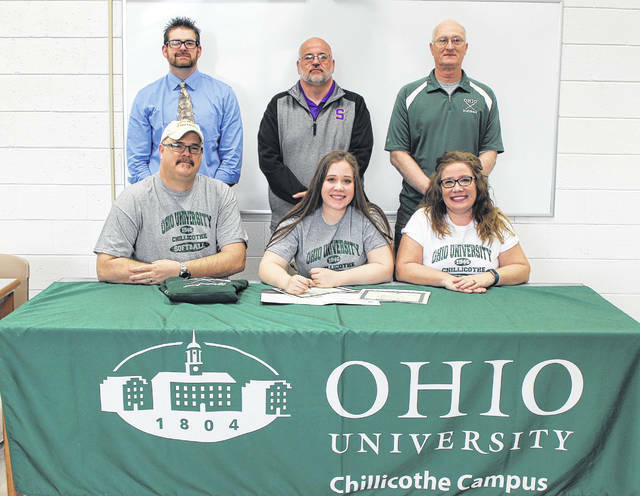 On Tuesday at Southern High School, VanMeter signed her National Letter of Intent to join the Ohio University-Chillicothe softball team next season. Entering her senior season, VanMeter has helped the Lady Tornadoes to a 40-25 record with a pair of sectional championships. As a freshman, VanMeter hit .428 in 63 at-bats and finished with 30 runs batted in and three home runs. She drove in 32 runs as a sophomore and hit .527 in 74 at-bats. In her junior season, VanMeter batted .606 in 71 at-bats, with 56 RBIs and 11 home runs. She tallied 14 doubles as a junior, the most of her career. Paige has been featured on the All-Tri-Valley Conference Hocking Division team in each of her first three seasons. VanMeter has also been named to the all-district team three times, as an honorable mention in 2015, a second team selection in 2016 and a first teamer in 2017. VanMeter was an All-Ohio honorable mention as a junior and made it into the state record books for a three-home run, nine-RBI game. “She started with us as a freshman at third base, did an excellent job for us,” Lady Tornadoes head coach Alan Crisp said. “Last year we got in a situation where I lost my catchers and she’s caught before, so we moved her back behind the plate and she did a good job. She’s going to be back there again this year for us. Last year she had an unbelievable year at the plate. 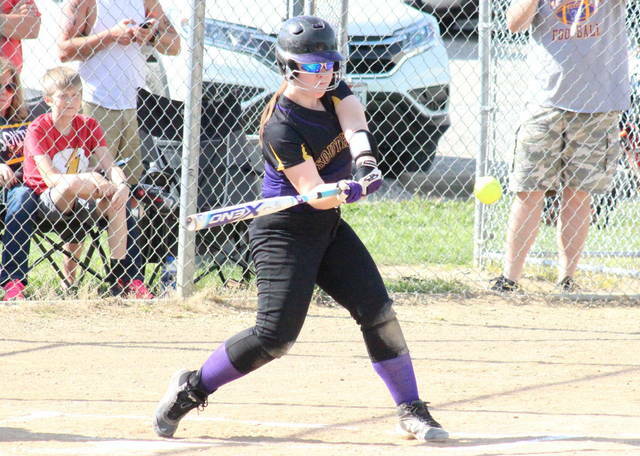 After her senior season, VanMeter will be joining a Hilltoppers squad that competes in the Ohio Regional Campus Conference and is led by head coach George Beck. At OU-C, VanMeter plans on majoring in Social Work, with the intent of becoming a medical social worker. At Southern, VanMeter holds a 3.3 grade-point-average and has also competed on the varsity volleyball and basketball teams.